The following is the history of the Ice Caves and the owner's family. 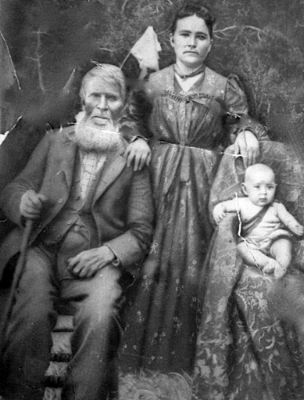 The Ice Cave family can trace our history to Manuel Antonio Candelaria (1837 - 1888) who was captured by the Navajos near Cubero, NM at the age of 9. He was later gambled to the Apaches and lived with them until he escaped at the age of 19. He then returned to Cubero and his Spanish heritage. Manuel Antonio Candelaria married Regina Baca, daughter of Benito Baca who homesteaded Agua Fria near the Ice Caves. Here Benito Baca ran a small trading post. Due to raids by the Navajo and hard winters, Manuel moved his family to Concho, Arizona. After a time, Benito Baca moved to Concho and abandoned the homestead at Agua Fria. The land that includes Agua Fria and the Ice Caves was eventually purchased by Sylvestre Mirabal in 1915. In the Concho Valley, Manuel was considered one of the Apaches and was allowed to live peacefully there. It was there that he began a successful sheep business with his sons. During this time he had a large family, ran a general store, opened one of the first banks in Northern Arizona, and secured over 100,000 acres of land for his sheep. When Manuel passed, his oldest son Juan took over the family business. Juan along with Sylvestre Mirabal envisioned joining their vast land holdings by arranging the marriage of Juan's three oldest sons to Sylvestre's three oldest daughters. Pictured right is Juan Candelaria, Son Of Mantel Antonio Candelaria. and his wife Santanita Ortega Candelaria. Juan built on the hard work of Manuel Antonio and created one of the largest most successful sheep empires in Arizona. He ran a general store with his brothers, and established one of the first banks in Concho. The Apache County Bank in Concho was the first bank in Northeastern Arizona Territory. This bank was established in 1902. Juan was widely respected by all and was considered one of the kindest men of his time. Young M. A. Candelaria was the oldest son of Juan Candelaria and father of David Candelaria, owner of the Ice Caves and Bandera Volcano. Manuel attended military school, and grew up to take over the sheep business, bank, and general store. Eventually he wed Prudencia Mirabal, thus combining vast tracks of land from the White Mountains of Arizona to Albuquerque New Mexico. A successful rancher and sheep man from San Rafael, New Mexico purchased the land that includes the Ice Caves and Bandera Volcano in the early 1900s. The land would expand Mirabal's vast holdings which were used primarily for grazing purposes. The Volcano and Ice Cave were considered to be just oddities in those days, and the ice was mined as a resource to cool the beer in the saloon that was built in the mid 1930s.The property was leased to various people in those days, but eventually the land that includes the Ice Cave would pass to his oldest daughter Prudencia. Sylvestre arranged the marriage of his oldest daughter, at the age of 15 to Manuel Candelaria, oldest son of Juan Candelaria of Concho, Arizona. The Candelaria brothers were equally successful sheep men who had vast land holdings of their own. Such a marriage would bring together lands that would stretch from Albuquerque New Mexico to the White Mountain area of Arizona. The land, needed for sheep and cattle, would ensure prosperity for the combined families for many years into the future. On the passing of her father Sylvestre, Prudencia became the owner of the property that included the Ice Caves and Bandera Volcano. During the mid 1930s, a saloon and dance hall was built by people leasing the land. By the mid 1940s those who leased the property moved on and Prudencia needed to find someone to manage the Ice Caves and Bandera Volcano for her. After several summers working at the Ice Caves, her youngest son David, his wife Reddy, and 2 year old Janet came to run the business at his Mother's request. The year was 1946. With youthful exuberance and a pioneering spirit, Dave and Reddy began the arduous task of managing and developing the Ice Cave and Bandera volcano as a tourist attraction. The early years were hard. The lack of roads, electricity, and phone lines made life difficult, but the vision they had for the Ice Caves spurred them on. Through their tireless efforts, the roads, phones, and electricity came, and so did the people. Trails were established that allowed the greatest number of people access to the beautiful Ice Cave and Bandera Volcano. The hard work of Dave and Reddy produced the highly accessible natural attraction you are visiting today. Over the years, the "Man Who Owns A Volcano" has worked hard to promote the Ice Caves and Bandera Volcano. In addition, he has worked to promote tourism for the State of New Mexico, and was elected as a charter member of the New Mexico Tourism Hall of Fame in 1997. The Ice Caves has been more than just a tourist attraction. It is a place where the Candelaria children grew up, family and friends visit, and many happy times are had. The Ice Cave continues to be run and operated by family members. The Candelaria family is happy to share this natural phenomenon with you. Dave, his wife Cora and their young daughter first came to manage the Ice Caves in 1946. It was love at first sight when the young family arrived here and began the tourist operation that exists to this day. It was an arduous task at first to bring visitors to this area before there were any signs, paved highways, electricity or phone service in the area. For over fifty years Dave and Cora devoted their lives, promoting this scenic treasure keeping with the ideals of natural conservation and historic preservation. In recognition of his longstanding efforts to promote tourism for New Mexico, Dave was inducted into the New Mexico Tourism Hall of Fame in 1997 by the Tourism Association of New Mexico. Dave and Reddy celebrated their Golden Anniversary the summer of 1993. Family and friends came from all over to help them celebrate this momentous occasion! A fine time was had by all at the Ice Cave with dancing, food, much laughter, and reminiscing! The spirit of the Ice Caves was in full bloom that day! The spirit and wonder of the Ice Cave and Bandera Volcano are kept alive today by Dave and Reddy's three daughters and their families! For over 60 years Dave worked tirelessly to develop and promote his dream of a natural scenic attraction at the Ice Cave and Bandera Volcano! Determination, dedication, and pride are evident in Dave's face as he ascends the stairs from the bottom viewing platform of the Ice Cave! Photo ca. 2006.